If you did not read my previous entry, where I rated the Isles goalies from this past season, you should take a look at before you read this. Now, I'm going to rate all of the Isles defensemen. This time, instead of using letter grades, I will use a scale of 0-100, with 100 being the highest possible grade. The numbers can give a more precise ranking than the letters did. 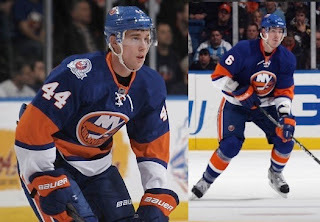 Any defenseman with more than 20 games played will be ranked, so one game wonders Calvin de Haan (left) and Ty Wishart (right) will have to wait to be ranked. They will get their chances. Enough with the future, let's look at the past season's defensemen. After playing 62 games during his rookie season, Hamonic came into this season knowing exactly what was expected of him. He did not disappoint any of the critics. This season, Hamonic appeared in 73 games, and kept on playing late in the season even though he had a broken nose. For most of the season, he was paired with Andrew MacDonald, and the two were a great defensive pair, oftene being sent out to play against the other team's top lines. Hamonic's offensive totals (2-22-24) aren't awful, but he known for defense, and some other stats prove it. He was 17th in the whole NHL in blocked shots with 157, and he also had 170 hits. Another baffling number is that Hamonic had the highest +/- of any Islander, registering a +6. That might not seem like much, but the fact that any Islanders were a positive this season is a statement in itself. If Hamonic can pick up his offensive game and keep his defensive game up, then he can be an elite defenseman in the years to come. While his partner Travis Hamonic definitely improved from 2010-11 to this past season, Andrew MacDonald might have regressed a little bit. In 2010-11, A-Mac only played in 60 games, but had 27 points (4-23-27) and was a +9. This previous season, he played in 75 games, most of them with Travis Hamonic, and only registered 19 points (5-14-19) and was a -5. What can be the reason behind this? One reason may be that he and Hamonic always played against opponent's top lines and that may have had something to do with it. Also, MacDonald has definitely not been as much of an offensive threat as he was in previous seasons. MacDonald has done great on defense, and his rating isn't any higher because of the significant points drop. If you have been clicking on players names throughout this entry, you have seen some of the highlights provided by the Isles this year. When you see the Steve Staios highlight, you gain satisfaction. At 38 years old, Steve Staios didn't even have a guaranteed contract in the preseason. It was only after Staios had a great preseason that the Isles signed him to play along Mark Streit as the top defensive pair. Staios played in 65 games this season, nine more than he played in his last two seasons combined with Calgary. He also played in his 1000th career game late in the season against the Jets. His offensive numbers (0-8-8) don't tell the whole story. Staios wore an 'A' on his jersey for all home games because of his ability to be a veteran leader and mentor on a team made up of very young players. His rating is only a 71 because he was a -19 for the season, and he really didn't too much. When watching him during games, I often found myself wishing Staios would do more. 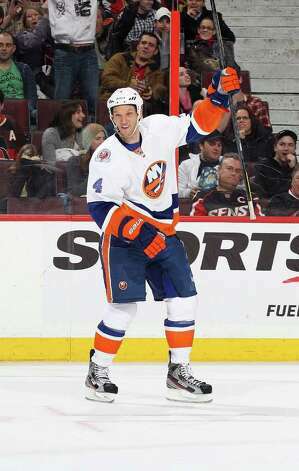 I dobut he will be back next season with all the young d-men the Isles have. Not a bad year for a man that resurrected his NHL career for another season. Milan Jurcina's season is also a very interesting one. This season, he played in 65 games, 19 more than he did in the previous season. However, his numbers are just dreadful. He only had 11 points. (3-8-11) It seems like all of his shots went wide, and he reminds me a little bit of Rick "Wild Thing" Vaughn in the Major League movies. He has a great slapshot, probably around or maybe over 100 miles per hour. However, he has trouble getting it on net. Another dreadful stat is his +/- of -34. You read that correctly -34. That means when at even strength, the other team scored 34 more goals than the Isles did when Jurcina was on the ice. If he can figure out his slapshot, then he can be a nice complement to Mark Streit. Reese has been called and recalled by the Bridgeport Sound Tigers mutiple times this season. Next season, I would hope that he will start the season in the NHL. He only played in 28 games this season, and in many of those games, he was paired with Mark Streit. He had seven points (1-6-7) in those 28 games. More suprisingly, his +/- was 0. He was dead even in that category. Reese is very young and talented, and with Steve Staios unlikely to return, a roster spot will be open. I think that Reese is the leading candidate for that spot. He is the guy the Islanders went to before Aaron Ness, Matt Donovan, and Calvin de Haan, who all had breif call ups. For this past season however, we didn't see too much, but we saw glimpses of what looks to be a bright future for a good young defenseman. What a year it's been for Mark Eaton. He is the textbook definition of a defensive defenseman. Most of the year, he was with Milan Jurcina, so his +/- took a hit at -17. But for at least one game in Ottawa, he was the man. It was his 600th National Hockey league game, a one to remember, and in overtime, he broke a long scoreless drought by scoring his first goal as an Islander. You can watch it by clicking on his name just above. Eaton has been a very solid defenseman for the past couple seasons. His rating is the way it is because while he has done little offensively, his defense has been superb. 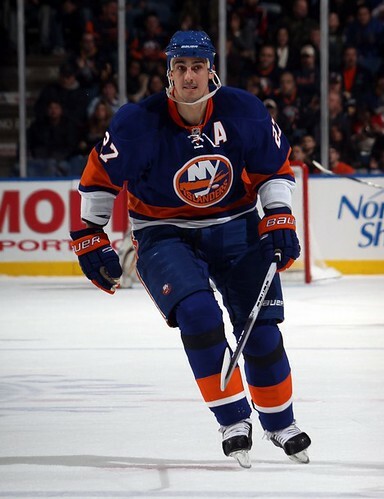 He should be back next season and I don't see why the Isles wouldn't bring him back. After missing all of the 2010-2011 season, the Islanders still had the confidence to name the 34 year old Mark Streit from Switzterland as the next team captain after Doug Weight's retirement. This season, Streit showed why he was an All-Star and led the team in points back in 2009. At times this season, mostly toward the end of the year, he played like the elite defenseman the Isles want him to be. Although his 47 points (7-40-47) are a decrease from his previous totals, Streit definitely had his best season as an Islander this year. Streit was the leader of the Islanders powerplay from the blue line, and he wasn't afraid to step up and go to the dirty areas near the opponent's net. Streit appeared in every Isles game this season, and one of the main reasons his ranking isn't higher is his +/- of -27. That just isn't good at all. If the Islanders can find Streit a great partner to compliment his offense for next season, they might have a legitimate chance at reaching the playoffs. That's it for the defensemen. Next up will be the forwards. Since there are so many of them, I might do the forwards in two separate entries. If you disagree with any of the rankings I made, I'd love to hear your opinions in the comments. The Islanders season is over. Another disappointing year for the Isles and their fans as we will once again sit at home and watch the postseason without the blue and orange. Once again they have a top 5 draft pick, this year it's the #4 pick. While the standings may not indicate such, many Isles have vastly improved their games since last season. In this entry, I will rate the goalies on a scale of A+ to F based on their performance (or lack thereof) this past season. After injuries gave Poulin the chance to play last year, he shined, going 4-2-1 in 7 starts before a fluke injury ended his season. This year, Poulin was called up quite a few times, but only appeared in six games. Part of that can be due to Evgeni Nabokov's good play, but the other part of that can be due to that when he was called up, he was rusty. He went 2-4-0 in those six starts. Both of the wins came against the Carolina Hurricanes. In those six games he posted a save percentage of .907 compared to .924 in his rookie season. Ultimately, there was too small of a sample size to accuratley grade Poulin. In the next few seasons, if Evgeni Nabokov gets traded or leaves, Poulin will be the first guy to get the call. He should be the Islanders goalie of the future, but in the present, he'll be in Bridgeport where he can excel and thrive, and try to lead the team to a Calder Cup. Montoya was also given a chance last year after a slew of injuries to goalies. In 2010-11, Montoya played in 20 games down the final stretch. In those games he posted a 9-5-5 record, 2.39 goals against average, and .921 save percentage. These numbers were good enough to earn Montoya a one year contract extension. This year, his numbers looked very different though. In 31 games played, he posted a 9-11-5 record, while having a 3.10 goals against average and an awful .893 save percentage. Montoya started the year as the starting goalie on opening night, and ended up winning two of the first three games for the Islanders. However, once Evgeni Nabokov started playing, Montoya was relegated to the bench. And, after suffering a concussion in Winnipeg in December, Montoya was sidelined for a little while, and when he came back, he just wasn't himself. I don't know if it's fair or not to give Montoya a B- in the rankings. He didn't have the best circumstances and once Evgeni Nabokov started playing, Montoya was not the same Montoya he was during the previous season. I don't think that the Isles will resign Montoya for next season but he has played well enough that he should find a job somewhere else in the NHL next season. 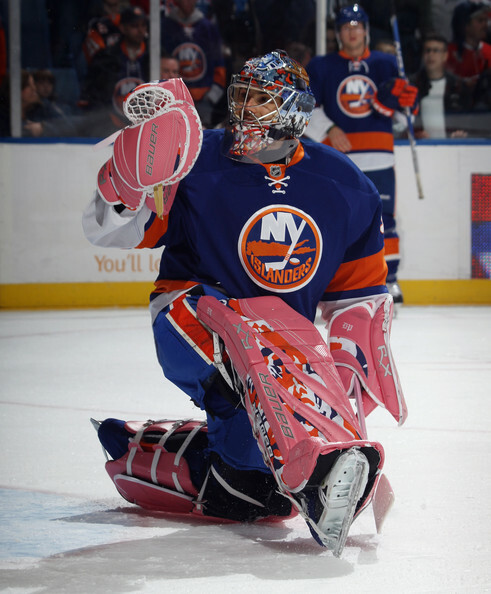 We all know about Rick DiPietro and his struggles. In October, a Brian Rolston slapshot got him in the face and took him out. Then in December, he had to get sports hernia surgery, once again ending his season. In 8 games this year, DP went 3-2-3 with a .876 save percentage. Not good. This marked the 3rd time in the last 4 seasons that DP has played in 8 or less games. He still has nine years left on his contract, and it doesn't look like he is going anywhere. There are three reasons I didn't give him an F. Firstly, he actually played in a few games and won a couple. Secondly, he had 2 assists on the year, giving him more than Nino Niederreiter. Thirdly, he tried to win the fans over by buying lunch for the first 5,000 fans at an Islander game at the end of the season. Too bad it takes wins, not lunches, to win over the Islanders fans. Nabokov has had a crazy ride to Long Island. After refusing to play for the Isles last season, he came back to the NHL and his first season on the Islanders will be considered a success many people, but Nabokov himself won't appreciate his season. He went 19-18-3 with a solid .914 save percentage in his first full season in the NHL since coming back from the Russian KHL, starting in exactly half of the games during the regular season. Nabby played like the elite goalie that he was for so many years with the San Jose Sharks, even winning games by himself at some points. 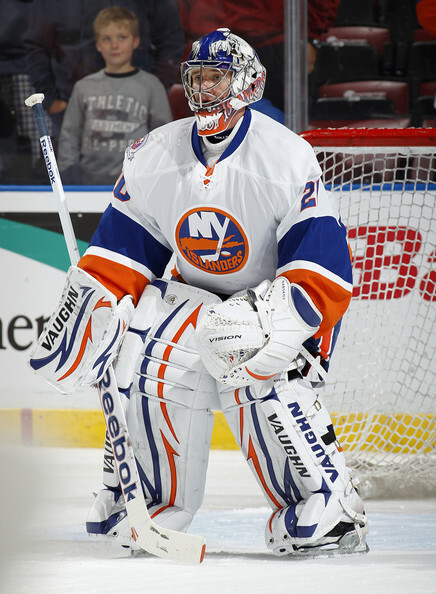 He will be back next season, and now, he is in line to be the Islanders starting goalie if all works out. If he plays just a little better than he did this season, than the sky is the limit for the Isles. Anders Nilsson was not given a grade because I am only grading the goalies that played in at least 5 games, he might get a better chance next season. That's it for the goalies. Next up will be the defensemen.